Hodshire AL, MJ Lawler, J Zhao, J Ortega, C Jen, T Yli-Juuti, JF Brewer, JK Kodros, KC Barsanti, DR Hanson, PH McMurry, JN Smith, and JR Pierce. 2016. 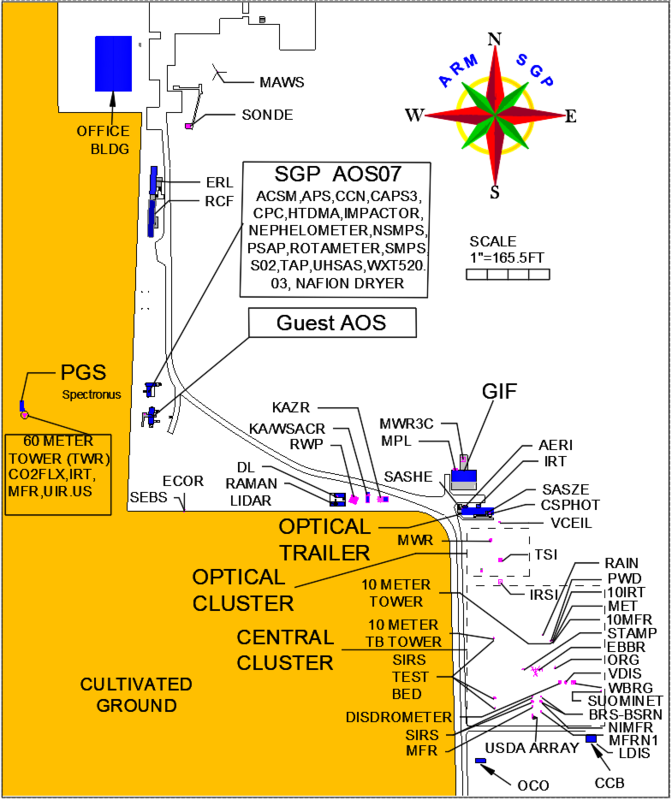 "Multiple new-particle growth pathways observed at the US DOE Southern Great Plains field site." Atmospheric Chemistry and Physics, 16(14), 10.5194/acp-16-9321-2016. Freshly nucleated particles in the atmosphere , ~1 nm in diameter, form from low-volatility gaseous species. These particles can either grow to climate-relevant sizes, larger than 50-100 nm in diameter, or are lost by coagulation with larger particles. If a particle reaches a climate-relevant size, it can affect climate through efficiently scattering or absorbing radiation or through altering cloud properties by acting as a cloud condensation nuclei (CCN). The competition between growth and loss by scavenging is an ongoing process throughout a particle’s lifespan, and although many modeling studies are able to capture coagulation well, the growth processes are not as well understood and are thus not represented well in models. Recent studies have shown that several processes contribute to new-particle growth, including condensation of low-volatility gaseous species (sulfuric acid and extremely low-volatility organic compounds [ELVOCs]) and acid-base reactions in the particle phase (organic acids with ammonia or amines). Global models generally only simulate condensation of sulfuric acid, the most-studied of these processes, and may include simplified representations of organic condensation. This study seeks to better understand the contribution to growth from the condensation of both sulfuric acid and organic vapors as well as the contribution from acid-base reactions of organic acids with ammonia and/or amines. By closely investigating gas-phase and particle-phase measurements of three new-particle formation events that occurred during the ARM Southern Great Plains (SGP) New Particle Formation Study (NPFS), the researchers found that each event had different dominant species in the growing particles. Simulating these events in a process-based particle-growth model that accounts for acid-base reactions and condensation of sulfuric acid and ELVOCs indicated that they are able to capture the differences between each day. Understanding how to better model growth processes will improve future regional and global models used to assess the climate impacts of aerosols. The ARM Southern Great Plains (SGP) New Particle Formation Study (NPFS) held from April 13-May 24, 2013, provided an intensive look at formation and growth processes of aerosol particles as well as an opportunity to gain insight into the atmospheric chemistry in this understudied region of the United States. Three new-particle formation events were identified, occurring on April 19, May 9, and May 11, respectively, that span a range of chemical conditions and air-mass histories (Figure 1). Each day’s event showed different dominant species in the growing particles: April 19 showed growth dominated by organics, May 9 showed growth dominated by ammonium sulfate, and May 11 showed growth dominated by sulfuric acid, amines, and organics. The researchers sought to determine if they could predict the variability of these growth events using current knowledge of aerosol growth theories by modelling these three days in the the Model for Acid-Base chemistry in NAnoparticle Growth (MABNAG), developed by Yli-Juuti, et al. (2013). MABNAG simulates (1) condensation of sulfuric acid, (2) condensation of ELVOCs, and (3) acid-base reactions, all processes that lead to growth of particles from nucleation size to CCN sizes. The data set from the NPFS provided the gas-phase inputs to MABNAG for these processes; the outputs were then particle growth and composition as a function of time. On each day, the modeled particle growth rates tend to either fall within the observed growth rate or slightly under-predict the observed growth rate, and the modeled particle composition shows the same dominant species contributing to growth as the observed particle composition shows (see example for May 9 in Figure 2). The researchers found that growth by sulfuric acid, ELVOCs, and organic acid-base reactions each contribute to growth to different degrees on each day. They hypothesize that modeled under-predictions in the observed growth rates come from MABNAG currently not accounting for higher-volatility species (e.g., low and semi-volatile organic compounds) that can contribute to growth. These higher-volatility species are challenging to measure in the field, but as measurement techniques continue to improve, future field campaigns such as the current HI-SCALE campaign taking place at SGP will improve our understanding of their contribution towards growth. (Top row) The growth events for April 19, May 9, and May 11, 2013, as captured by a scanning mobility particle sizer at SGP. (Bottom row) The associated 48-hour Hysplit back trajectories for each day as calculated using the NOAA Hysplit Model with NAM meteorological data, initialized at 250 m AGL. Measurements and example MABNAG prediction for 9 May, 2013. Blank spaces in the measurement data indicate times that instruments were not operational. (a) Gas-phase acids and ELVOC estimate. (b) Gas-phase bases. (c–d) Particle-phase data. (e) Particle size distribution with the modeled growth rate (black line). The red and black points indicate the mean collection particle diameter for the particle-phase data. (f–g) Modeled particle composition as a function of size.